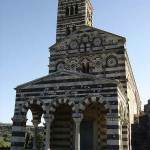 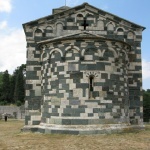 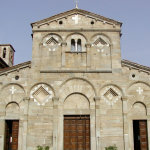 The architectural style known as Pisan Romanesque developed in Pisa, in the western part of Tuscany, and in the territories that fell under its political influence such as the islands of Corsica and Sardinia. 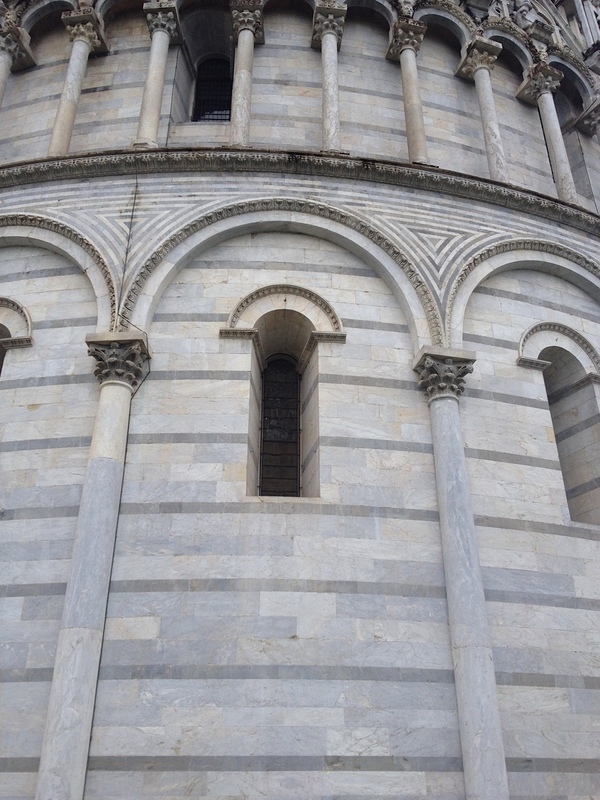 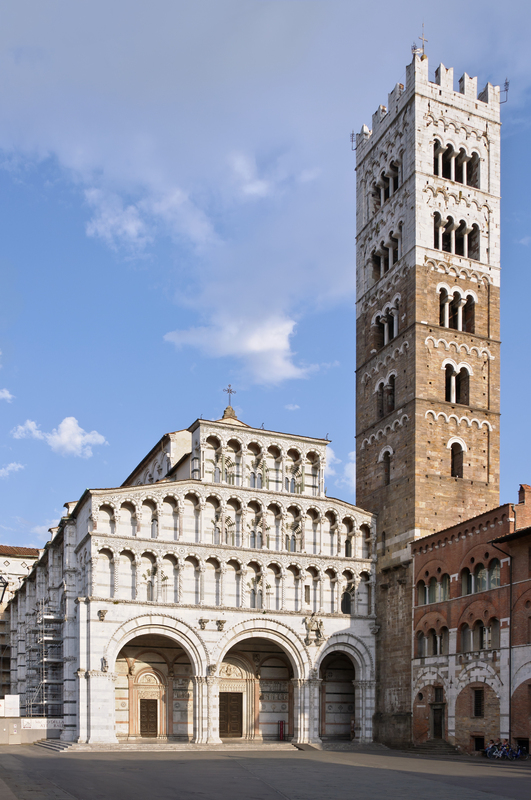 The style was further refined during the course of the 11th century, and found mature expression in the construction of the Cathedral of Pisa, which was begun in 1064. 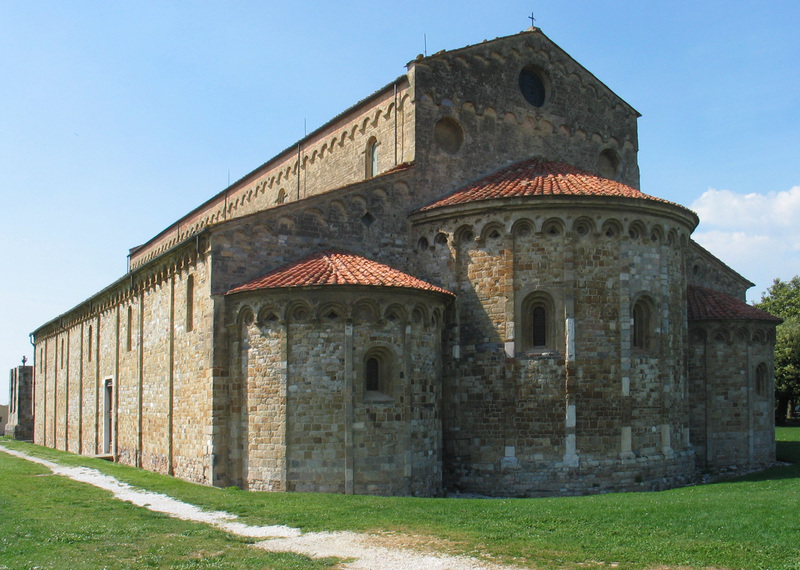 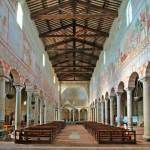 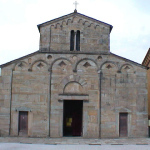 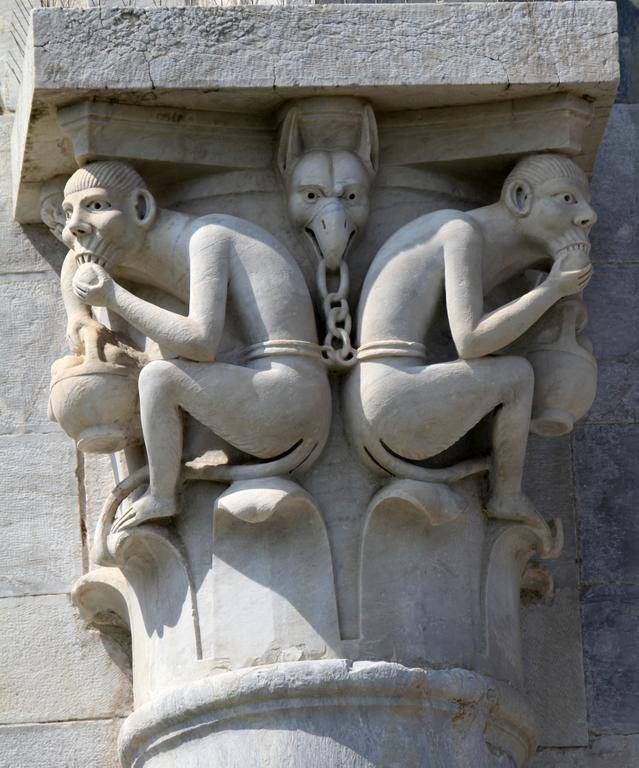 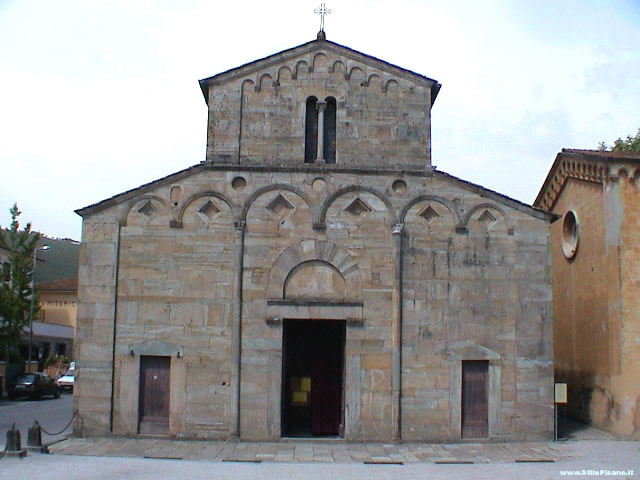 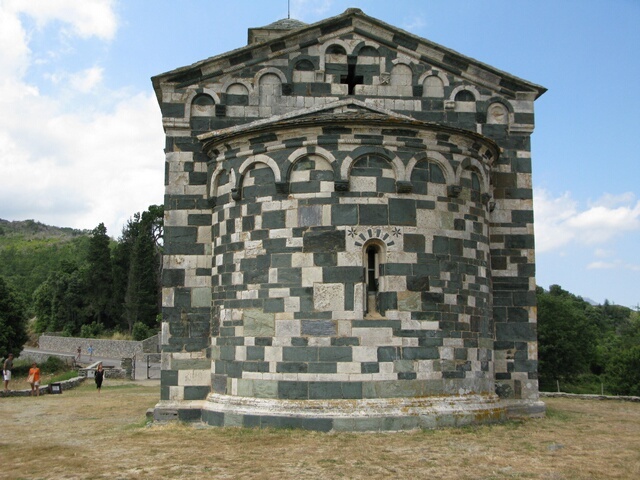 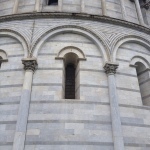 The new style immediately spread beyond Pisa, reaching its apogee in the 12th century, when numerous churches and other buildings were constructed one after another in Pisa and its territories, providing various examples of the mature Pisan Romanesque style. 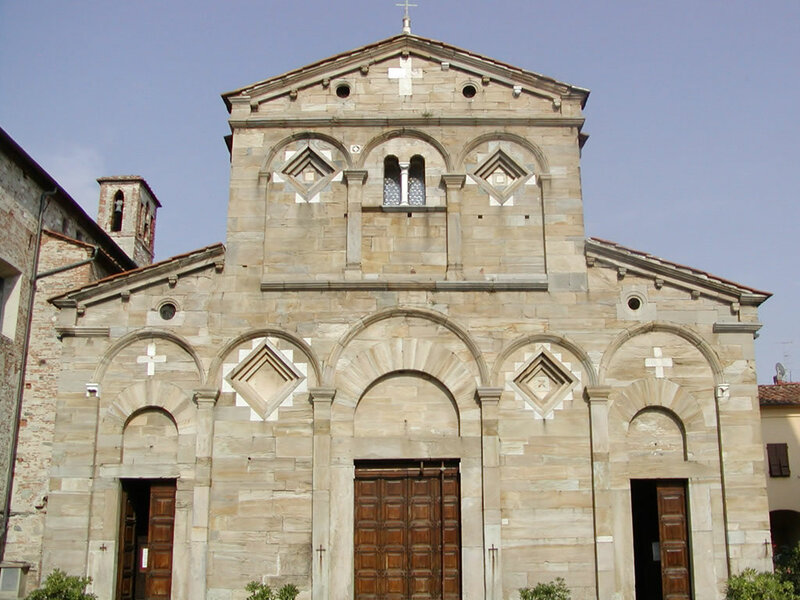 This style continued to evolve during the 13th century, particularly in the cities of Tuscany (such as Lucca), and from the middle of the century would begin to incorporate decorative elements from the Gothic style. 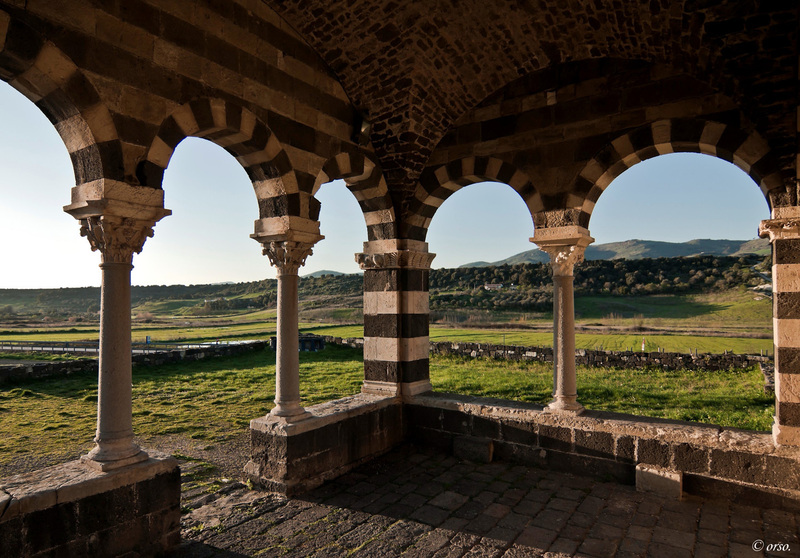 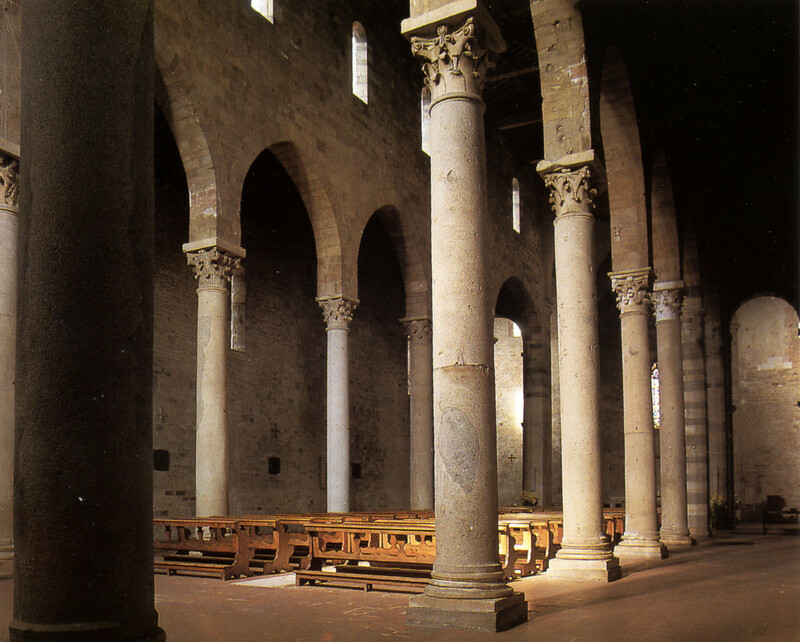 The spread of Pisan Romanesque architecture reflected the political and military importance of Pisa, which had become a powerful maritime republic. 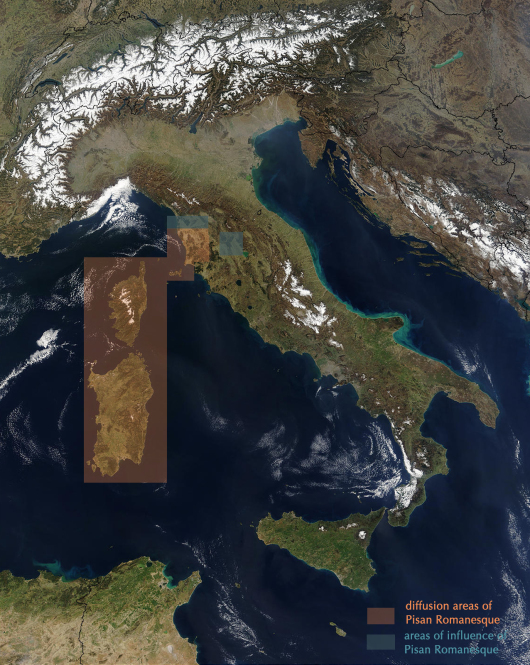 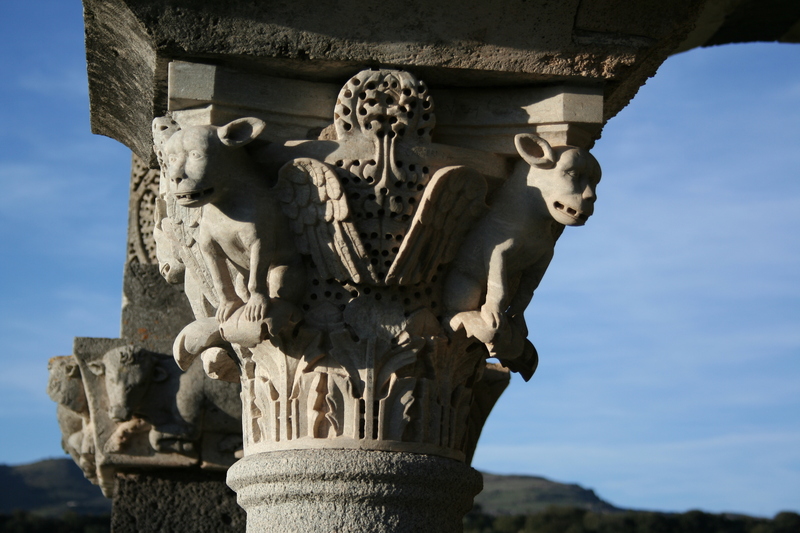 The city dominated a large portion of the Mediterranean, establishing commercial and cultural ties with many populated areas and urban centers located around its rim, from the islands of Majorca and Sicily to Constantinople and from Palestine to the coast of North Africa. 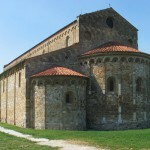 The main features of the Romanesque style were its evocation of the architecture of late Roman antiquity, such as the first Christian basilicas built in Rome under the emperor Constantine, and the incorporation of architectural elements borrowed from Roman and Byzantine architecture to create new and harmonious compositions. 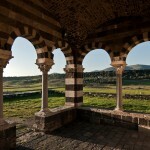 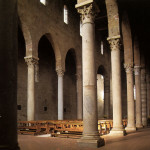 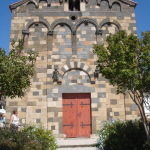 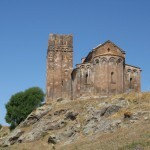 Typical of Romanesque buildings were rows of imposing columns in marble or granite surmounted by capitals decorated with plant motifs and connected by semi-circular arches. 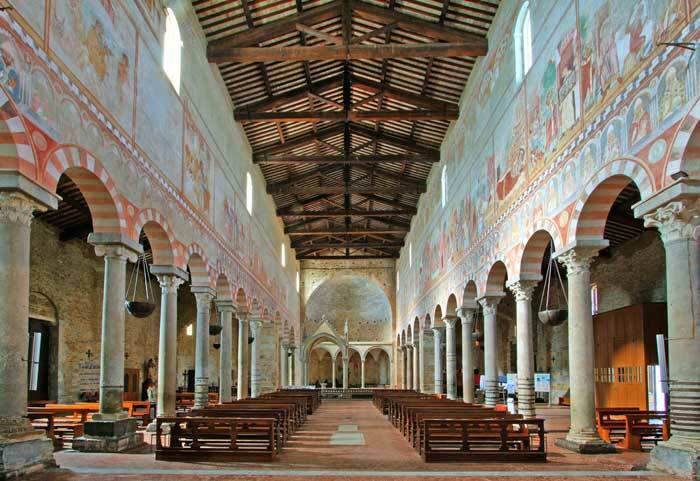 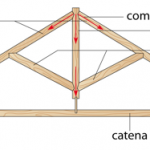 The interior might terminate in a large semicircular apse and be covered with a trussed wooden roof. 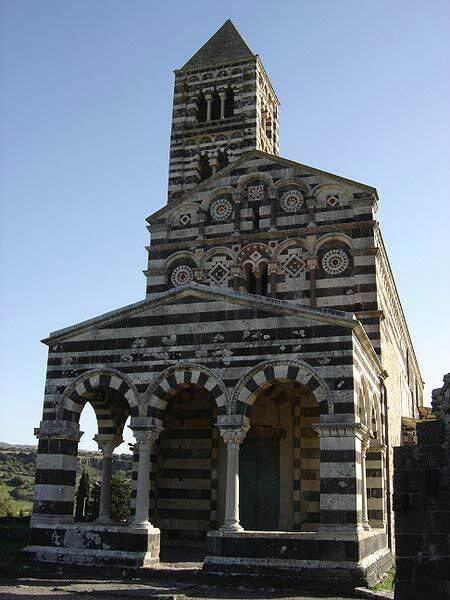 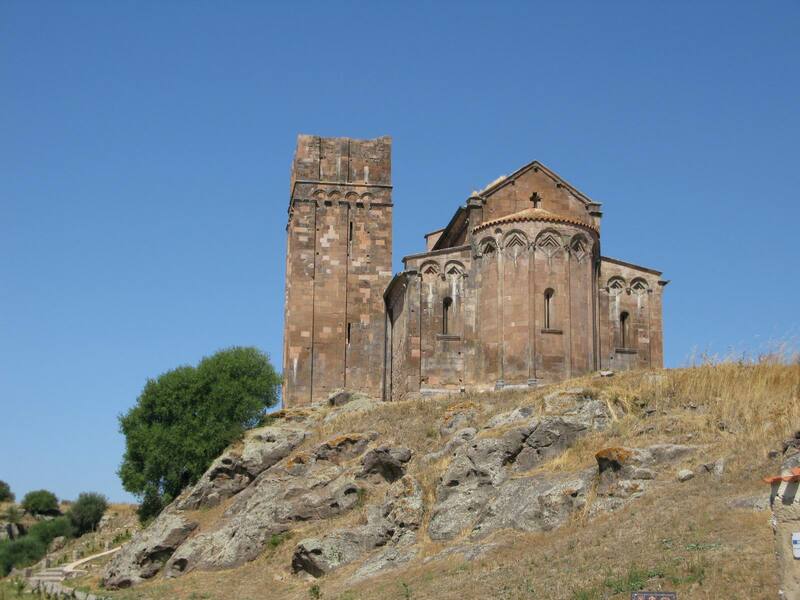 The buildings were constructed in the local stone – volcanic tuff, Verrucan stone (a conglomerate of quartz and other minerals), or often the white and gray marble quarried in the mountains of Monti Pisani close to the city. 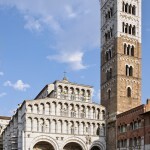 In other parts of Tuscany the white marble of Carrara, the green marble of Prato, the travertine of Siena, or granite from the islands of Elba, Corsica, and Sardinia might be used. 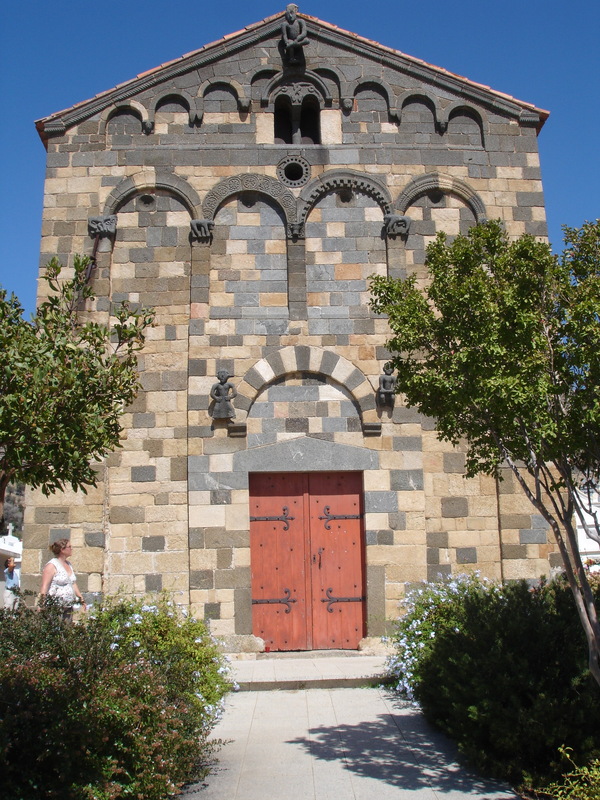 The Pisan Romanesque style can be easily recognized by its use of alternating rows of different kinds of stone in contrasting colors. 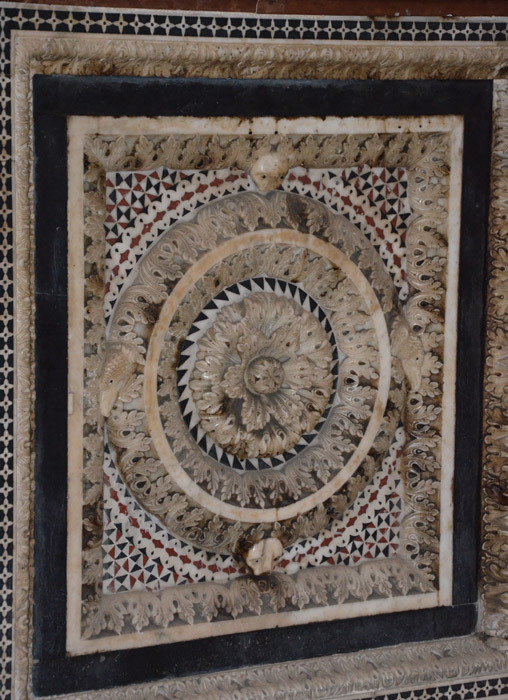 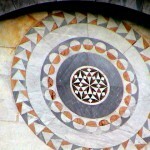 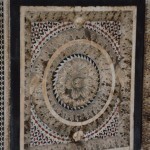 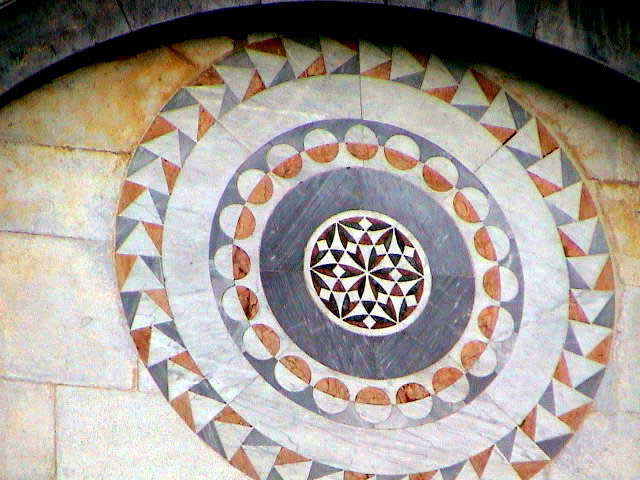 Typically the facades were decorated with stone inlay in marble of different colors arranged in geometric patterns, sometimes with the addition of animal motifs. 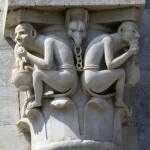 They can usually be found in the multiple orders of blind arches that decorate the facades of these buildings. 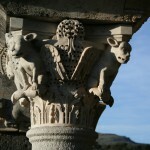 The cornices and capitals might also contain figurative motifs, such as small animals with symbolic meaning or, on occasion, scenes from the Bible and the lives of the saints.